383 Marlborough is located on the north side of Marlborough, between Hereford and Massachusetts Avenue, with 381 Marlborough to the east and 385 Marlborough to the west. 383 Marlborough was designed by architect Obed F. Smith and built in 1880-1881 by Vinal & Dodge, masons, and G. & E. Stewart, carpenters, for building contractor George Wheatland, Jr., for speculative sale. It was one of six contiguous houses (381-383-385-387-389-391 Marlborough) built at the same time and one of twelve contiguous houses (369-371-373-375-377-379-381-383-385-387-389-391 Marlborough) built for George Wheatland, Jr., in 1879-1881. He is shown as the owner of 381-391 Marlborough on the original building permit application for the six houses, dated November 11, 1880 (one application for six houses). Click here for an index to the deeds for 383 Marlborough, and click here for further information on the land on the north side of Marlborough between Hereford and Massachusetts Avenue. George Wheatland, Jr., subsequently built the twelve houses at 369-391 Marlborough on 276 feet of the combined 280.58 foot parcel (the 4 feet to the east and the 0.58 feet to the west were sold by his father to others). As the houses were completed, William D. Pickman and the estate of William P. Fay (who had died in March of 1879) transferred their two-thirds interest to George Wheatland, Sr. He subsequently sold the houses to individual purchasers. On April 11, 1882, 383 Marlborough was purchased from George Wheatland, Sr., by Kate J. (Mead) Southard, the wife of attorney Charles B. Southard. They previously had lived at 231 West Canton Street. They continued to live at 383 Marlborough during the 1891-1892 season, but moved thereafter to 31 Bay State Road. On April 18, 1892, 383 Marlborough was acquired from Kate Southard by N. Henry Chadwick, one-half in his own name and one half as trustee under the will of his former business partner, Oscar L. Stillings. Their firm – Chadwick & Stillings – was originally a hat block and flange company and became a significant house contractor and builder in the 1880s and 1890s. On June 16 1892, 383 Marlborough was acquired from N. Henry Chadwick by Dr. Gustavus Hay, an ophthalmologist and surgeon. He and his wife, Miriam (Parsons) Hay, made it their home and he also maintained his medical office there. They previously had lived at 91 Charles. Living with them were Gustavus Hay, Jr., Gustavus Hay’s son by his first marriage, to Maria Crehore, and Charles Chauncy Hay, Gustavus and Miriam (Parsons) Hay’s son. Gustavus Hay, Jr., an attorney, married in July of 1901 to Caroline Barker Whiting. He was killed about two months later, on September 18, 1901, in a railroad accident in Avon, when the Cape Cod Express collided with a freight train. Charles C. Hay married in October of 1903 to Elizabeth McCluskey. After their marriage, they lived with his parents. 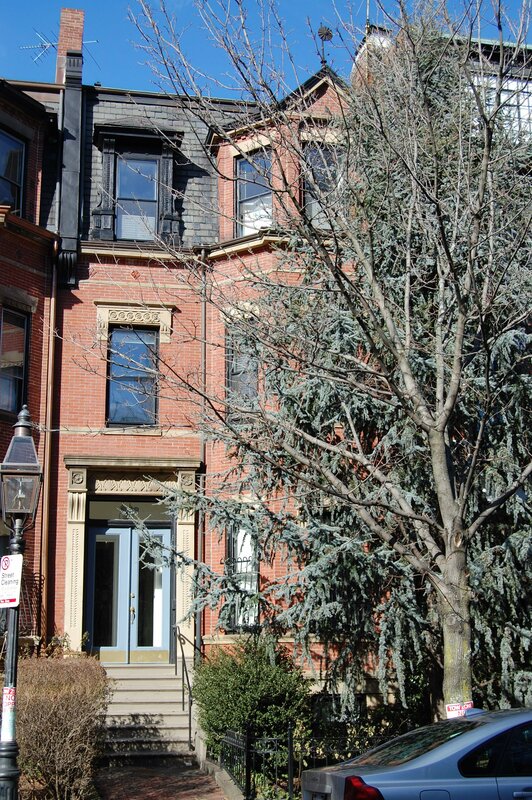 They all continued to live at 383 Marlborough during the 1904-1905 winter season, but moved thereafter to Jamaica Plain. Gustavus Hay died in April of 1908. On June 10, 1905, 383 Marlborough was purchased from Gustavus Hay by William B. Durant, an attorney. It appears that he purchased the property on behalf of the Mount Vernon Congregational Church at the corner of Beacon and Massachusetts Avenue. By the 1905-1906 winter season, 383 Marlborough was the home of Rev. Albert Parker Fitch, pastor of the Mt. Vernon Church, and his wife, Flora May (Draper) Fitch. They previously had lived at the Hotel Cambridge at 483 Beacon. On June 16, 1905, 383 Marlborough was acquired from William Durant by Annie Louisa (Dickinson) Woods, the widow of wholesale dry goods merchant Henry Woods. She lived at 69 Mt. Vernon. Henry Woods had been a member of the Mt. Vernon Church’s building committee when it moved from Beacon Hill to the Back Bay in the early 1890s and had purchased the land at Beacon and Massachusetts Avenue on behalf of the church. The Fitches continued to live at 383 Marlborough until about 1909, when they moved to Cambridge and he became President of the Andover Theological Seminary. On November 22, 1909, 383 Marlborough was acquired from Annie Woods by the Mount Vernon Congregational Society. By the 1909-1910 winter season, 383 Marlborough became the home of Rev. James Austin Richards and his wife, Hazel Temple (Read) Richards. They previously had lived in Newport, Rhode Island. Rev. Richards was Rev. Fitch’s successor as pastor of the Mt. Vernon Congregational Church. The Richardses continued to live at 383 Marlborough during the 1916-1917 season, but moved thereafter to Brookline and by 1920 were living in Winnetka (Cook County) Illinois. 383 Marlborough was not listed in the 1918 and 1919 Blue Books. By the 1919-1920 winter season, 383 Marlborough was the home of James W. Keif (born James Keefe), an engineer, and his wife Hannah M. (Forrest) Keif. They previously had lived at 113 St. Botolph. They continued to live at 383 Marlborough during the 1920-1921 season, but moved thereafter to 228 Commonwealth. On January 2, 1920, 383 Marlborough was acquired from the Mount Vernon Congregational Society by the Mount Vernon Church. It continued it own the house house lease it to others until 1923. By the 1921-1922 winter season, 383 Marlborough was the home of Dr. James Albert Honeij and his wife, Florence I. (Graham) Honeji. He was a physician specializing in radiology, and had recently retired as a professor of roentgenology at Yale. They continued to live at 383 Marlborough during the 1922-1923 season, but moved thereafter. He died in January of 1924. In 1923, the Mt. Vernon Church acquired 490 Beacon to be its parish house (the acquisition having been made on the church’s behalf by Helen Margaret (Woods) Craig, the widow of David Rankin Craig and the daughter of Henry and Annie (Dickinson) Woods). The new property was adjacent to the church and, therefore, more conveniently located than 383 Marlborough. On May 7, 1923, 383 Marlborough was acquired by the estate of Dr. Hasket Derby and became the home of his widow, Sarah (Mason) Derby. She previously had lived at 13 Hereford. Her son and daughter-in-law, Arthur Lawrence Derby and Jeanette (Barr) Derby, lived with her. He was a consulting engineer and later a stock and bond broker. They had moved by about 1928, but resumed living with her in about 1931. In about 1932, they lived briefly in an apartment at 7 Exeter (his nephew, Hasket Derby II and his wife, Alison Lawrence (Haughton) Derby, also lived at 7 Exeter at that time). By 1933, they were once again living with Sarah. Derby at 383 Marlborough. From about 1933, Sarah Derby’s daughter, Eloise Lloyd Derby, lived with her at 383 Marlborough. She also maintained a residence in Paris. At about the same time, Sarah Derby’s granddaughter, Mary Brewster Derby, also made 383 Marlborough her home. She had lived at 7 Hereford with her parents until their deaths: Dr. George Strong Derby who died in 1931 and Mary Brewster (Brown) Derby who died in 1933. Mary Derby continued to live with her grandmother until about 1937, when she moved to an apartment apartment at 381 Marlborough. Sarah Derby, the Arthur Derbys, and Eloise Derby continued to live at 383 Marlborough until Sarah Derby’s death in March of 1939. They also maintained a home at Bar Harbor. 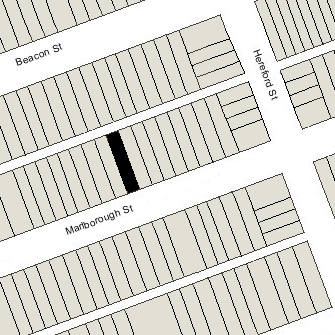 After her death, Arthur and Jeannette Derby moved to an apartment at 381 Marlborough. In January of 1940, 383 Marlborough was acquired from Hasket Derby’s estate and heirs by real estate dealer Henry Joseph O’Meara. On February 13, 1940, 383 Marlborough was acquired from Henry J. O’Meara by Jessica M. Carbee. She lived there with her parents, Scott Clifton Carbee and Mary P. (Jones) Carbee. They all previously had lived in an apartment at 318 Commonwealth. Scott Carbee was a noted artist and operated an art school at 126 Massachusetts Avenue. Jessica Carbee worked as the office secretary at the school. Mary Carbee died in 1944 and Scott Carbee died in June of 1946. After their deaths, Jessica Carbee continued to live at 383 Marlborough. On April 3, 1964, 383 Marlborough was acquired from Jessica Carbee by Benjamin J. Greenberg, an electrical contractor. He and his wife, June Rose (Guckert) Greenberg, made it their home and operated it as a lodging house. In February of 1984, Donald Cote filed for (and subsequently received) permission to legalize the occupancy as four apartments. He indicated that was an existing condition. On June 20, 2005, 383 Marlborough was acquired from Kenneth Kruse and Donald Cote by the 383 Marlborough Street LLC. .383 Marlborough remained an apartment building, assessed as a four- to six-family dwelling, in 2017.